Most all adults know the basics of the original wilding-teens thrill-killing: Nathan Leopold, 19, and Richard Loeb, 18, enticed and then murdered acquaintance Bobby Franks, 14, in 1924. No less than Clarence Darrow defended Loeb, and managed to keep them from the death penalty. They had no motive other than the idea that killing and getting away with it would be a fabulous intellectual exercise. Like their emotional descendants at Columbine they began with petty vandalism, then spent months planning the murder. However unlike those philosophical descendants they did not intend to get caught—not getting caught was the whole point. By now the idea of murdering for kicks, especially when carried out by privileged white boys, is de rigueur—but I had never thought through how radical this concept must have seemed in 1924. For one thing, violent crime belonged to the lower classes— then, as now, more often occurring among those between a socioeconomic rock and a resource-lacking hard place. Well brought-up children were not expected to act out beyond schoolyard pranks. Third, murders were presumed to have been committed for a reason—anger, lust, a fabulous inheritance. It was a difficult, messy, extremely risky proposition, so why on earth would anyone do it if it were not strictly necessary? No wonder the murder of Bobby Franks stunned, amazed, and baffled the populace. If we consider mystery/thriller books written before this time—Poe’s Murders in the Rue Morgue, Wilkie Collins’ The Moonstone, the Sherlock Holmes stories, they mostly dealt with puzzles (likely what Leopold and Loeb were trying to emulate), yet the killers had a definite reason to want the victim dead. Then came the very American gangster stories, with lots of violence, but violence for gains such as contraband or expanding territory. But art eventually imitated life. By the 1950s, novels began to appear with remorseless, motiveless killers who not only selected victims more or less at random but plenty, and often— I have thirteen books out, and have not yet been brave enough to keep the body count under three. These killers have no reason for their actions other than enjoyment. Though we find them as inexplicable today as readers did in 1924, these villains are now ubiquitous, slaughtering fictional victims right and left without a single tangible gain other than a quickly faded thrill. So in that respect, perhaps Leopold and Loeb changed the face of mystery fiction forever. A fascinating discussion to me on the interplay of novels and the Leopold/Loeb case. I agree with you that the public didn't understand psychopathic behavior - or maybe hadn't heard of it prior to the case. I seriously doubt however that it originated with Leopold and Loeb. That the case originated in the beginning of the 20th century when news and information were more plentiful than they had been in the past centuries - also with more modern crime fighting techniques it was earlier for authorities to track down the culprits. There have always been people who killed for the thrill of it - it just was just done secretly or in ways that society found acceptable: think of the Old West. The murders of Native Americans. In Europe, how aristocrats could and would kill people from the lower classes just for fun. 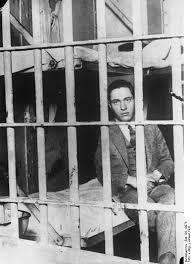 There have always been psychopaths among us: Leopold and Loeb just helped us recognize them for what they are. Thanks for a thought provoking post. I expect Sandy is right, that it had more to do with news being more plentiful. Add to that the fact they were caught... History is full of this. I think some killers disguised it better. Excellent post re historical perspective. These days we often hear ourselves saying, "but that was a different time." This illustrates that saying so well. As for someone else who changed later suspense writing, Ted Bundy has my vote. He set the bar high for personable bad guys preying on young women. And still fascinates many as the current crop of Ted projects bear out.